Have you considered including SAHC in your estate planning? By including SAHC in your will, you can help build the long-term financial strength of SAHC and continue protecting the places you love, forever. A planned gift is a flexible and creative way to be philanthropic while meeting your personal, family or financial goals. There are many options to think about and when including SAHC in your estate planning, but we are here to make it easy for you. Your gift can help shape the future of your community and help ensure that generations will enjoy the precious gifts of nature – just as you do. No matter your financial circumstances and charitable goals, there are planned giving options available to meet your needs. If you have questions about planned giving, please contact Pauline Heyne, Director of Philanthropy, at pauline@appalachian.org or 828.253.0095 ext. 216. If you have included SAHC in your estate plans, please let us know. We would like to thank you for your generosity, make sure the purpose of your gift is understood by us, and recognize you as a member of the Legacy Society. 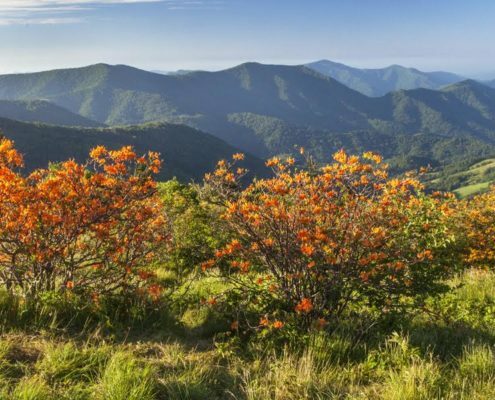 The most popular and easiest method of leaving a legacy gift is to include the Southern Appalachian Highlands Conservancy in your will or living trust. By making a bequest to SAHC (a bequest is a gift from your estate—a transfer of cash, securities, or other property made through your estate plans) you will need to include language in your will or living trust leaving a portion of your estate to SAHC. Your estate can save both on income taxes and estate taxes if you name SAHC as the beneficiary of your IRA, 401k or other qualified retirement plan. This is a simple and tax-efficient way to benefit the work of SAHC. Tax benefits for gifts of appreciated real estate are virtually identical to those for gifts of appreciated securities. Real property such as personal residences, undeveloped land, or farms may be transferred by deed with no liability for income or estate taxes on the appreciated value. Land trusts are in a unique position to accept gifts of real estate – we can guarantee permanent protection of special lands, or we can accept gifts of “trade lands” – property donated with the intention it will be sold to preserve significant conservation properties elsewhere. Discuss your wishes with us before making your gift. Making a beneficiary designation through your life insurance plan is an easy and affordable way to support the work of SAHC. By naming SAHC as the beneficiary of an individual or group term life insurance policy, the benefits from your policy pass to us free of federal estate tax after your lifetime. You could purchase a new policy or donate a policy that you currently own but no longer need. Check with your insurance agent for the details. You can guarantee a fixed income for your life and your spouse’s life by transferring cash or appreciated securities in exchange for a Charitable Gift Annuity (CGA). With a CGA, you can support the work of SAHC now while retaining secure, fixed payments for life. A CGA accomplishes two goals—preserving the landscapes you cherish through a gift to SAHC and retaining income through fixed payments to you and/or your loved ones. You may also receive an immediate income tax deduction. You can fund a charitable remainder trust with cash or appreciated property and receive income from the assets for your lifetime, qualify for charitable deductions, and save capital gains and estate taxes. Upon your death and/or that of a loved one, the trust assets would be distributed outright to SAHC. Under this arrangement, you transfer assets to a trust that makes payments to SAHC for a specified number of years, after which time the assets are transferred to your heirs. The charitable lead trust allows you to pass assets on to your children and grandchildren with little or no estate and gift taxes. It can make good sense for anyone in the top estate and gift brackets. The Southern Appalachian Highland Conservancy’s tax identification number is: 62-1098890.